Babblings of a Mommy: Covergirl Lashblast Fusion Review. 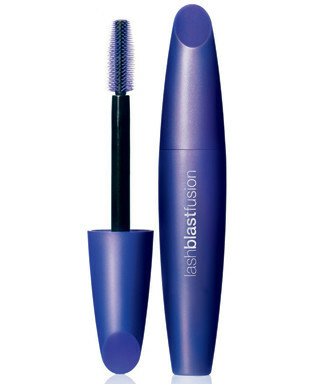 Covergirl Lashblast Fusion hit stores a few months back and I just never got around to trying it till now, so thanks BzzAgent! The Lashblast collection from Covergirl is one of those mascaras that you either love or hate. I actually happened to like the original Lashblast so I couldn't wait to see how this new Lashblast Fusion stacks up. "The fiberstretch formula and oversized brush makes every little lash bigger, fuller, longer-looking, and more dramatic." Well, here's what I think: I have short pathetic lashes that can use any help they can and if they promise Volume + Length--oh, hell yeah! I'll try it! The first thing I noticed is that the brush is LONGER but not as WIDE as the original Lashblast. It's still big but if you were intimidated by the original then this one may work a little better for you. It DID extend my lashes without clumping or creating the dreadful spider lashes, so that was a plus. I got the Very Black shade and it did a good job of coating all my lashes evenly, however I still think that the Original creates more volume than the Lashblast Fusion. Overall I think this a good mascara. It's not GREAT isn't not BAD. It does what it promises by lengthening although I think it can do a better job on fattening up the lashes. Would I recommend it? well...I think mascaras work differently on different lashes so I would say to give it a try and see how it works on you. This product was provided through bzzagent.com for review purposes. I just purchased this and went to use it to find out in my hast to get out of the store with two anxious chitlins I bought brown instead of black! I will be going back to get the right color and your review is giving me good hopes that it will work for me. I know how you feel. There's been times I got to the store to buy one specific thing and I end up forgetting the ONE thing I was suppose to get because I was chasing my hyperactive kid.